This essay examines these three issues and then offers several different policy solutions to the problems. This stands in contrast to the predictions derived from standard economic models which perhaps better characterize the circumstances of higher income families in a position to save more and then draw upon those same savings in the event of an unanticipated negative income shock. Similarly, higher income families possess greater access to credit markets that can serve the same purpose in response to temporarily low income. This is consistent with the dramatic fall in TANF caseloads since the middle 1990s. The program today provides less in cash assistance per case than in the 1980s and 1990s, and appeared to be unresponsive during the Great Recession of 2007-2009.9 The welfare reform law that created TANF occurred amid a large economic expansion, and the program should be adjusted to reflect new realities. Income volatility is driven by a combination of aggregate macroeconomic shifts alongside individual-level events such as job losses and gains. Especially for low-income and less-educated workers, this volatility is indicative of a riskier labor market. With these conditions in mind, the first set of solutions presented below are the most ambitious and call for reforms to TANF and the Supplemental Nutrition Assistance Program, or SNAP. The reforms would enhance job training in sectors of high local-labor demand, providing both financial and employment support, suspend time limits on TANF assistance, create minimum state requirements for the provision of TANF cash assistance, and increase SNAP generosity. The remaining solutions presented below would provide families with greater liquidity to buffer against economic risk and uncertainty through an expanded Unemployment Insurance system. These reforms also would reconsider program recertification periods and re-introduce advance Earned Income Tax Credits (as an elective option for tax filers. Below, I summarize each of these policy solutions. Following the spirit of recent reform proposals by Georgetown University public policy professor Harry J. Holzer related to community colleges,12 such training programs would include community college career training, and would be coordinated with Workforce Innovation and Opportunity Act providers and, as a result, be deemed by WIOA providers as subject-training areas of high local-labor demand to ensure trainees have strong employment prospects.13 States would be encouraged to include non-custodial parents in such training programs, and job-seekers within TANF would be eligible for public-sector employment and infrastructure jobs as they become available.14 Due to years of under-investment, there are labor shortages and opportunities to train workers in local sectors with high demand, including healthcare as well as elements of the nation’s aging transportation, water, and electricity infrastructure-related trades. Income volatility is a reflection of an increasingly competitive, dynamic, and at times unpredictable employment situation in the United States, particularly among low-income and less-educated workers. The Temporary Assistance for Needy Families program can help buffer against this risk by suspending time limits under qualifying circumstances while maintaining work requirements. Approved education and training would be permitted to occur full time and without work/job search, and would not count against the 5-year federal time limit—stopping the clock. Adults who satisfactorily complete TANF- and WIOA-approved education and training and/or engage in continuous job search efforts would receive assistance, even if they breach the time limit. 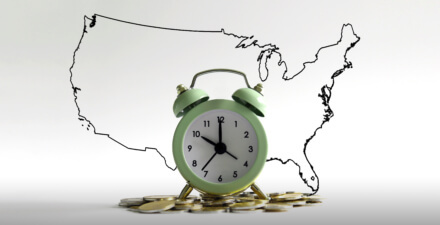 Next, states would be required to allow qualifying recipients to remain on welfare for the entire 5-year federal time limit—the current policy sets five years effectively as a maximum with a state option to provide extended benefits, but this would now be a minimum standard. Finally, following the recommendations of Marianne Bitler at the University of California-Davis and Hilary Hoynes at the University of California-Berkeley,15 time limits would be suspended during periods of high local unemployment or joblessness, much like the allowable suspension for high local unemployment in the Supplemental Nutrition Assistance Program for able-bodied adults. Importantly, work requirements would remain in place, and TANF participants would still be subject to sanctions and removal via administrative rules and/or rules violations. This modified version of TANF—with its work requirements and rules—retains a design promoting temporary participation relative to the predecessor policy, whereas time limits in their current form in some states potentially undermine the capacity of the program to respond to changing economic circumstances. Following the recommendations of Bitler and Hoynes, I recommend that states be required to spend at least 25 percent of their TANF funds on cash assistance.17 Increasing cash assistance will help to ensure that the nation’s most vulnerable families are better protected against negative income shocks. The Earned Income Tax Credit is the largest cash transfer for the working poor. While the EITC program has well-documented employment and anti-poverty benefits, it is not constructed to address income volatility in its current form. First, the refund occurs as a lump sum at tax time. While this benefits families as a form of precautionary savings, those that face weekly or monthly income shortfalls do not benefit from support that is backloaded until tax season. Re-introducing an optional Advance EITC, whereby filers could elect to have the EITC distributed paycheck-to-paycheck over the entire year, would provide families with several thousand dollars of immediate income support.21 Hybridized versions similar to the Advance EITC would allow a portion of the full EITC to be made available throughout the year.22 Although participation in the Advance EITC program was low prior to being discontinued in 2011, employers and human resources professionals could more aggressively promote it as a financial tool. The Earned Income Tax Credit is of little or no use for low-income individuals who are jobless—by design EITC receipt is predicated on labor market earnings.23 At the same time, a growing share of workers are part-time and many have work-history gaps leaving them uncovered by the current Unemployment Insurance system. Rachel West and her co-authors at the Center for American Progress offer a range of suggested reforms to the Unemployment Insurance system that would provide financial incentives for workers who find new employment in a lower paying job—from covering part-time workers to covering workers with less than five quarters of work history.24 These workers, varying state-to-state, generally lack protection via the unemployment insurance system. Many hold more than one part-time job, and do so in the absence of access to stable, full-time employment. Such reforms can provide an important buffer in the event of earnings loss due to unemployment, and would reflect the modern growth in part-time, contingent work arrangements. In the absence of substantial Unemployment Insurance reform, the aforementioned TANF solutions loom especially large—many individuals are currently underserved by both programs. In some states, low-income families participating in SNAP, TANF, Medicaid, and low-income housing assistance are required to provide eligibility verification, by program, throughout the year. As a consequence, many such households flow in and out of eligibility for these programs, raising the possibility that families lose out on benefits when they find themselves to be temporarily in need—or when complexity in the renewal process causes qualifying families to cycle off the program. Currently the typical program requires re-certification at a rate of every six months to one year. I recommend extending recertification periods to once per year while simplifying and aligning recertification across safety net programs. 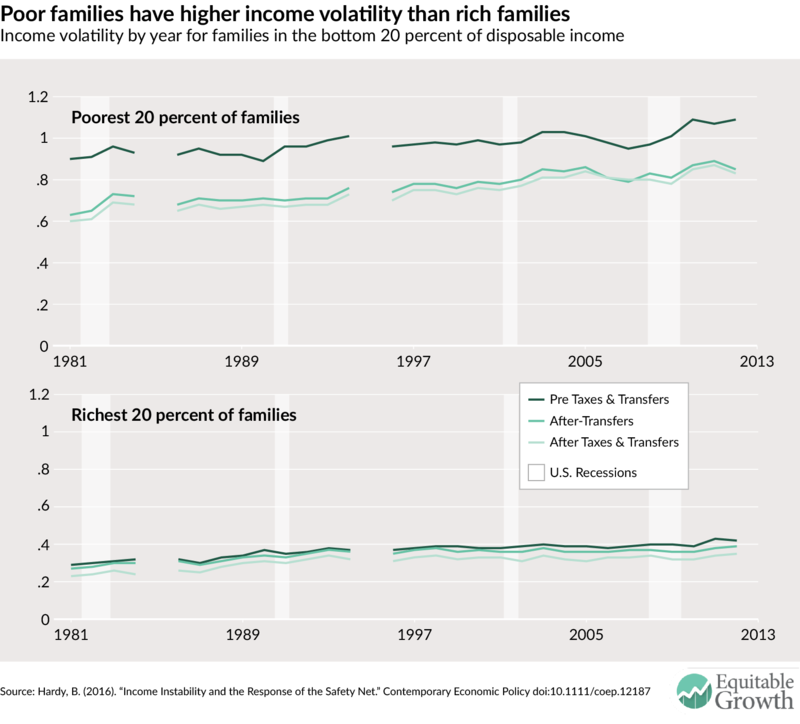 Income volatility is highest among lower income and less-educated Americans. While the safety net provides some buffer against volatility, changes can be made to better address the reality of low and volatile income. Some firms see this need, and are introducing flexible pay plans that allow workers to withdraw their earned income on a daily basis to meet immediate consumption needs that arise between pay periods.25 Still, such private initiatives are working at the margins of a larger challenge—many workers find themselves unemployed or under-employed in sectors of the economy offering low, unpredictable earnings. Moreover, many families lack the resources to buffer against negative and unanticipated economic shocks. To address this, the safety net can provide greater cash assistance via TANF and SNAP, including financial assistance to support families while they participate in approved job training as well as during periods of high unemployment. Such assistance would operate in part through a conditional suspension of time limits in TANF. In addition, part-time and less-experienced workers should have greater access to the unemployment insurance system, and the working poor and near poor could benefit from an optional Advance EITC that spreads the credit over the year. Taken together, the policy recommendations put forth in this essay aim to address income volatility among low-income workers by providing greater liquidity and insurance against negative shocks while providing a wider range of job training opportunities to move workers into higher demand, stable employment opportunities. These policies retain the values of work that are embedded in the current set of programs while providing a pathway for workers to respond to economic risks that characterize today’s dynamic, globally competitive economy. 1 Bradley L. Hardy, “Income Instability and the Response of the Safety Net,” Contemporary Economic Policy doi:10.1111/coep.12187 (2016). 2 Molly Dahl, Thomas DeLeire, and Jonathan A. Schwabish, “Estimates of Year-to-Year Variability in Worker Earnings and in Household Incomes from Administrative, Survey, and Matched Data,” Journal of Human Resources, 46, 4, 750-774 (2011). 3 Peter Gottschalk and Robert Moffitt, “The Rising Instability of U.S. Earnings,” Journal of Economic Perspectives 23, no. 4 (2016): 3-24. 4 Karen E. Dynan, Douglas W. Elmendorf, and Daniel E. Sichel, “The Evolution of Household Income Volatility,” The B.E. Journal of Economic Analysis & Policy 12, no. 2 (2012); Peter Gottschalk and Robert Moffitt, “The Growth of Earnings Instability in the U.S. Labor Market,” Brookings Papers on Economic Activity 1, 217–254 (1994); Steven J. Haider, “Earnings Instability and Earnings Inequality of Males in the United States: 1967–1991,” Journal of Labor Economics 19, no. 4 (2001): 799–836; B. Keys, “Trends in Income and Consumption Volatility, 1970–2000,” in Income Volatility and Food Assistance in the United States, D. Jolliffe and J. P. Ziliak, eds., (Kalamazoo, MI: W.E. Upjohn Institute 2008); Bradley L. Hardy and James P. Ziliak, “Decomposing Trends in Income Volatility: The ‘Wild Ride’ at the Top and Bottom, Economic Inquiry, 52, no. 1 (2014): 459-476. 5 Income volatility is measured as the standard deviation of income before and after accounting for safety net transfer programs. See Hardy, “Income Instability and the Response of the Safety Net,” for a discussion of research background and methodology. 6 Michael Barr, “Financial Services, Saving and Borrowing Among Low- and Moderate-Income Households: Evidence from the Detroit Area Household Financial Services Survey“ in Insufficient Funds: Savings, Assets, Credit and Banking Among Low and Moderate Income Households, edited by M. Barr and R. Blank, (New York: Russell Sage Foundation, 2009). 8 Bradley L. Hardy, “Income Instability and the Response of the Safety Net,” Contemporary Economic Policy doi:10.1111/coep.12187 (2016). 9 James P. Ziliak, “Modernizing SNAP Benefits,” (Washington, DC: The Hamilton Project—Brookings Institution, 2016). 10 S. McConnell, I. Perez-Johnson, and J. Berk, “Providing Disadvantaged Workers with Skills to Succeed in the Labor Market,” in Policies to Address Poverty in America, edited by M.S. Kearney & B.H. Harris, (Washington, DC: The Hamilton Project, 2014). 11 Randi Hall, “Expanding Education and Training Opportunities Under TANF: A Path to Stable Employment in Today’s Economy,” (Washington, DC: Center for Law and Social Policy, 2016) describes the current policy with respect to education and training within TANF, noting that education and training activities do not generally count towards the state’s work participation rate, a key HHS metric by which State TANF programs are evaluated. 12 Harry J. Holzer, “Improving Employment Outcomes for Disadvantaged Students,” in Policies to Address Poverty in America, edited by M.S. Kearney & B.H. Harris (Washington, DC: The Hamilton Project—Brookings Institution, 2014). 13 Gretchen C. Kirby and Julia Lyskawa, “Coordinating Employment Services Across the TANF and WIA Programs,” OPRE Report #2015-03, (Washington, DC: U.S. Department of Health and Human Services, Administration for Children and Families, Office of Planning, Research and Evaluation, 2015), provide a detailed description of coordinated employment services between TANF and WIA/WIOA programs. 14 William Darity and Darrick Hamilton, “Bold Policies for Economic Justice,” The Review of Black Political Economy 39 (2012): 79-85, propose a federal employment program targeted toward infrastructure and other areas of high demand. 15 Marianne Bitler and Hilary Hoynes, “Strengthening Temporary Assistance for Needy Families,” (Washington, DC: The Hamilton Project—Brookings Institution, 2016). 16 James P. Ziliak, “Modernizing SNAP Benefits,” (Washington, DC: The Hamilton Project—Brookings Institution, 2016). 18 Dottie Rosenbaum and Brynne Keith-Jennings, “SNAP Caseload Declines Accelerated in Recent Months: Return of Three-Month Time Limit a Factor in Many States,” (Washington, DC: Center on Budget and Policy Priorities, 2016). 19 Bradley L Hardy, Timothy M. Smeeding, and James P. Ziliak, “The Changing Safety Net for Low Income Parents and Their Children: Structural or Cyclical Changes in Income Support Policy?” Working Paper (2015). 20 James P. Ziliak, “Modernizing SNAP Benefits,” (Washington, DC: The Hamilton Project—Brookings Institution, 2016). 21 See A. Nichols and Jesse Rothstein, “The Earned Income Tax Credit,” in Means Tested Transfer Programs, edited by R.A. Moffitt, Forthcoming, (Chicago: National Bureau of Economic Research and University of Chicago Press, 2015), for a discussion of EITC and the Advance EITC program, which was discontinued in 2011. 22 Rebecca Vallas, Melissa Boteach, and Rachel West, “Harnessing the EITC and Other Tax Credits to Promote Financial Stability and Economic Mobility,” (Washington DC: Center for American Progress, 2014), offer a proposal providing for EITC receipt throughout the calendar year. 23 It is plausible that moderate income workers fall into EITC eligibility via part-time and/or part-year employment. 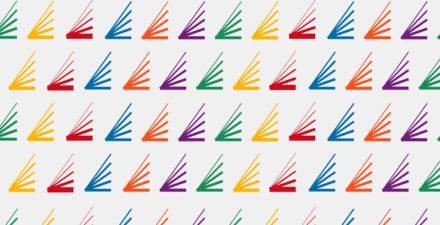 24 Rachel West, Indivar Dutta-Gupta, Kali Grant, Melissa Boteach, Claire McKenna, and Judy Conti, “Strengthening Unemployment Protections in America: Modernizing Unemployment Insurance and Establishing a Jobseeker’s Allowance,” (Washington DC: Center for American Progress, 2016).